Have you ever wondered exactly WHAT is in that kombucha SCOBY? You know, that floating thing that is responsible for fermenting sweet tea into a healthy drink full of probiotics? Well here is what the research says about those little micro-organisms living in your SCOBY. "Oh! NO Way," my friend stated flatly and firmly. (I had just asked if she wanted to give some of my kombucha a try.) "I will NOT drink anything with bacteria or a floating body in it!" She screwed up her face in complete disgust. :-) I had to laugh! Sadly, many people harbor fears and misconceptions about fermentation and especially kombucha...and ESPECIALLY when they can actually SEE the SCOBY! It really kind of freaks a lot of people out! Even I have to admit: It’s a creepy looking thing. I always have two gallons of kombucha fermenting away on the counter in my kitchen. It's SO funny to watch people's faces when they notice them! One of my friends always asks, "How is your placenta doing?" If you don't know, fermenting kombucha contains a large, slimy blob that looks a little like a body of tissue floating peacefully away in the drink. One question I always get asked without fail is, "What is that? What's it made of?" So, What is a SCOBY? A SCOBY is an acronym that stands for “Symbiotic Culture of Bacteria and Yeast.” Pretty cool, right? When the right kind of bacteria come into contact with the right kind of yeast—-it’s a great relationship. Together, the yeasts and bacteria cause fermentation of the sugars and tea combination, creating a lovely and healthy drink that can even be naturally carbonated. Kombucha seems like a pretty mysterious fermented probiotic drink, until you get to know it, that is. After all, the composition and ingredients of each batch are always slightly (or a lot) different from the next, depending on several factors: the length of time of the ferment, the size of the SCOBY, the type and strength of tea, whether or not there was a 2nd ferment, the type of sugar used, and on and on! Basically, the SCOBY contains several strains of yeast and bacteria that live together in complete symbiotic harmony. They actually depend upon each other to live! It's a pretty great little community! The SCOBY will continue to grow as long as all the proper conditions are met...and they can get pretty large! Get the Newsletter & Never Miss a Thing! What is in Your Kombucha Tea? Because of the fermentation process, there are trace amounts of alcohol in most kombuchas. Generally, this amount is extremely small, less than 0.5 % alcohol. If the amount of alcohol is over this limit, the federal government requires labeling to inform consumers of the alcohol content. Some kombucha teas, however, have been found to have a much higher percentage of alcohol. I personally have never experienced any problems with any kombucha having too great an alcohol content---one enough to affect me. However, people with alcohol sensitivities should probably take some care. The sugar that is used to ferment the kombucha is consumed by the SCOBY, for the most part. However, depending on the length of time of fermentation, the SCOBY may not have had time to consume all the sugar if it is a shorter ferment. Or, some people just like their kombucha a little sweeter--in that case, yes, there will be some sugar in the kombucha. Hannah Crum of Kombucha Camp states that there is generally about 2 to 6 grams of sugar in an unflavored 8 ounce glass of kombucha. To compare, there is about 24 grams of sugar in a glass of orange juice. I like longer ferments for my kombucha, so they tend to be more tart than sweet. In my opinion, I'm not that concerned with the sugar content. In addition, the creators of the Whole30 lifestyle plan, which is modeled after the paleo diet, state that kombucha is one of the drinks that are fine to have on the plan...and added sugar is NOT allowed on this plan whatsoever. Yes, it is very possible for kombucha to contain a bit of caffeine. It will not be nearly as great as coffee, and most people will probably feel no effects. Again, if you are sensitive to caffeine, you can make your kombucha with decaffeinated teas. The base of most kombucha tea is from Camellia sinensis species of tea, out of which White Tea (the least caffeinated), Green Tea, Oolong Tea, and finally Black Tea (the most caffeinated) originate. All of these contain a bit of caffeine to one extent or another. This is the thing that looks a little like a body. SCOBY stands for Symbiotic Culture of Bacteria and Yeast. Read on to find out what is in that thing that causes your Kombucha Tea to ferment AND be so good for you! Sign Up Here for the Newsletter and Never Miss a Thing! Isn’t this SCOBY just gorgeous? So, What is In a SCOBY? This is my favorite part of kombucha! These strains of yeast and bacteria are what cause kombucha to be so good for you! They are what cause the unique fermentation process! There are different strains in different cultures of SCOBY...they will not always be the same. It depends on your environment and where you got your SCOBY: if it is a "wild fermentation," if you obtained one from a friend, if you "grew" one from some starter liquid, or even from a lab if it is a culture that has been "created." The strains of yeast and bacteria are what causes kombucha to have its special flavor and also what causes the fizzing in the fermentation process. Yes, those bubbles are good to see! These strains of yeast and bacteria are what helps to heal our guts and provide many other health benefits. Find out more about why fermentation is so good for you! Acetobacter: This is always found in kombucha, and it is what builds the SCOBY. Acetic acid and gluconic acid are produced by this bacteria. Saccharomyces: These are yeast strains of which one or more can be found in your kombucha. They are responsible for the creation of alcohol and yeast. Pediococcus: Also create lactic acid and slime. Like lactobacillus, they may or may not be in your kombucha. Gluconacetobacter kombuchae: This little bacteria is only found in kombucha. It produces acetic and gluconic acids, plus it helps build the SCOBY. Zygosaccharomyces kombuchaensis: This is a yeast strain, also unique to kombucha. It helps carbonate and fizz your kombucha as well as helps fill out the body of the SCOBY. SCOBY’s are pretty interesting living colonies! There are probably other contributors to the kombucha process or microscopic organisms found in kombucha, but the above lists are the most common. Acetic acid, gluconic acid, and fructose are always present, in addition to slight amounts of sugars, possibly caffeine, and varying but small amounts of alcohol. I have grown to love the taste of kombucha, and now that I'm experimenting with 2nd ferments, the choices of flavors and health benefits from adding herbs and fruits are endless! I feel the health benefits far outweigh the small amounts of sugar, alcohol, and caffeine. Also, for other related articles, you might want to take a look at How to Make Herbal Kombucha and How to Make Your Kombucha Fizzy. 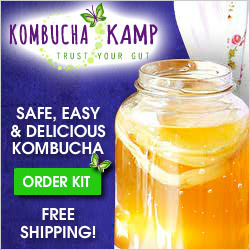 And if you want to get started making your own kombucha, check out that link for the basics. If you’re all set to get going now, I recommend making a visit to Kombucha Kamp! You’re going to find the best cultures over there. Do you have more questions or comments? I love to hear from you, so please leave a comment in the comments section. P.P.S. Also--I'd love if you would follow me on Pinterest, Facebook, and Instagram! Disclaimer: The information in this article, elsewhere on my blog, in my shop sites, in conversations, and on labels is for informational purposes only and not meant to cure, treat, diagnose, or prevent any medical condition. I am not a medical doctor, so please see a medical professional for concerns. I simply provide my own personal advice based on experience and study for ways to live a healthy and natural way of life. I disclaim any liability arising directly or indirectly from the use of any of the information contained in this article or elsewhere on this website. These statements have not been evaluated by the FDA. Find out what is in a SCOBY. What is a SCOBY anyway? How does it ferment the kombucha tea? What is really living in a SCOBY? Find out everything you want to know about the living kombucha SCOBY and how it makes kombucha so healthy. Mar 19 How Do You Make Your Own Herbal Kombucha? PLUS, Find Out What on Earth It is!